We all scream for ice cream! Is there anybody who doesn’t like ice cream? We doubt it! And now you can have it any time you want. You have two options. The first one is to go to your closes supermarket and buy it, which is fine, but it isn’t going to be fresh and the varieties can quickly get boring, plus you don’t have control of the ingredients. The second option is to get an ice cream maker and eat as much as you want any time you want. This might not be good for you figure, but it will definitely satisfy your cravings, plus healthier snacks like frozen yogurt can be made. The market is swamped with ice cream makers, so how can you choose the right one?! We will give you the details on one of them and that is the very highly regarded and well reviewed Cuisinart ICE-30BC. 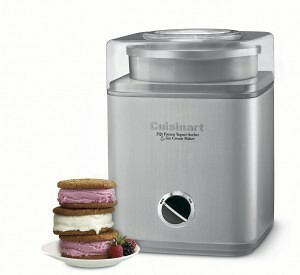 Cuisinart ICE-30BC is a fully automatic maker which you can use to make all kinds of frozen delights. You can make frozen yogurt, sorbet, ice cream, basically whatever frozen desert you can think of you can make it! The good thing is that you can easily experiment with different ingredients and create many flavours. You can make different recipes every day, until you run out of ideas. 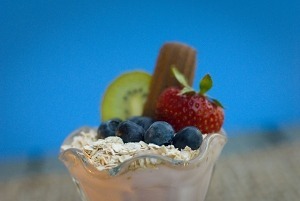 And today due to the wide spread of the internet you will have a lot of ideas and recipes to choose from. This maker is made of stainless still and has a heavy duty motor. It consists of several detachable parts. First of all you have the housing where the freezer bowl is placed, then the freezer bowl itself, the ice cream dasher and a lid. They are all made of quality materials and are very durable. It has an impressive two quartz capacity meaning you can make a high volume of ice cream to feed a lot of people, plus, of course, it will keep for a long time in your freezer, so no pressure to eat it all at once. Here is how the Cuisinart ICE-30BC works. First of all you should put the bowl into the freezer. It is recommended that you leave it over nigh on 0 degrees in order to freeze well. Once the freezer bowl has frozen take it out and place it in the hosing. You should use the freezer bowl immediately after you take it out of the freezer as it will start to melt. Next you should put the ingredients inside and add the ice cream dasher. The dasher is the one that makes the ice cream. Then put the lid on. You will notice that the lid has a huge opening on top. This opening is used to add additional ingredients and spice up your recipe. Turn it on and that is all you need to do. It usually takes 20-25 minutes for the frozen treat to be ready. If you want your desert to be more solid you can put it in the freezer for some time, not to mention it can be kept in the freezer for consumption at a later date. With this you have completed the procedure of making frozen dessert. As you can see the Cuisinart ICE-30BC is easy to use and very practical. It is a temptation to have in the kitchen, but who can blame us? This product has almost exclusively received five star reviews on amazon and is well reviewed wherever you go on the internet, with people commenting on its durability, build quality and of course the amazing ice cream and frozen yogurt it produces. When you think of yogurt, one of the first things to spring into your mind is Greece – in many ways the world home of yogurt, and something millions of us consume every day, well now you can make it at home! If you are looking for a Greek yogurt maker, then you will find this article useful. Making Greek yogurt is easy, all you need are some tools and some knowledge. 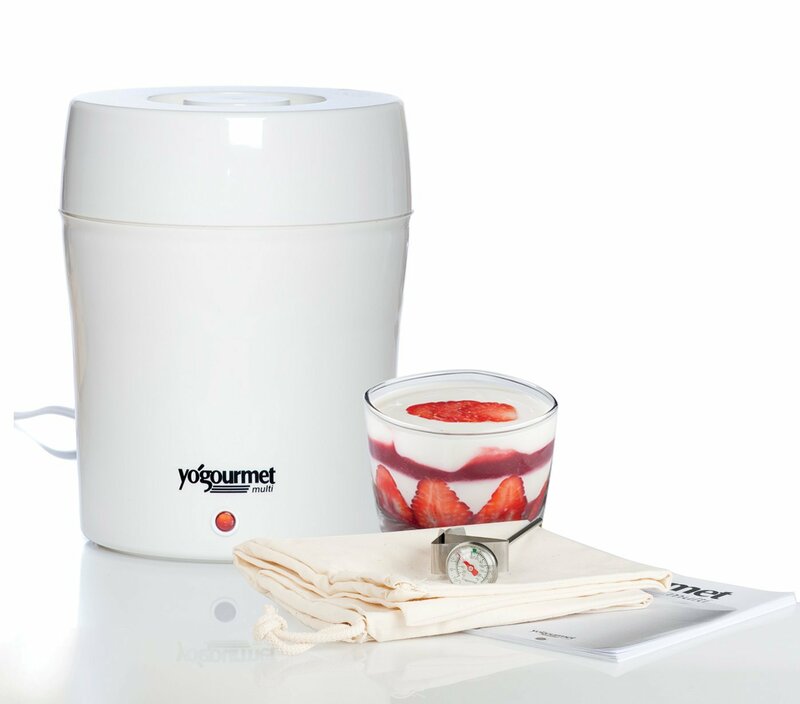 The yogurt makers featured here have everything you need to make Greek yogurt effortlessly. The first option is great quality and affordable! 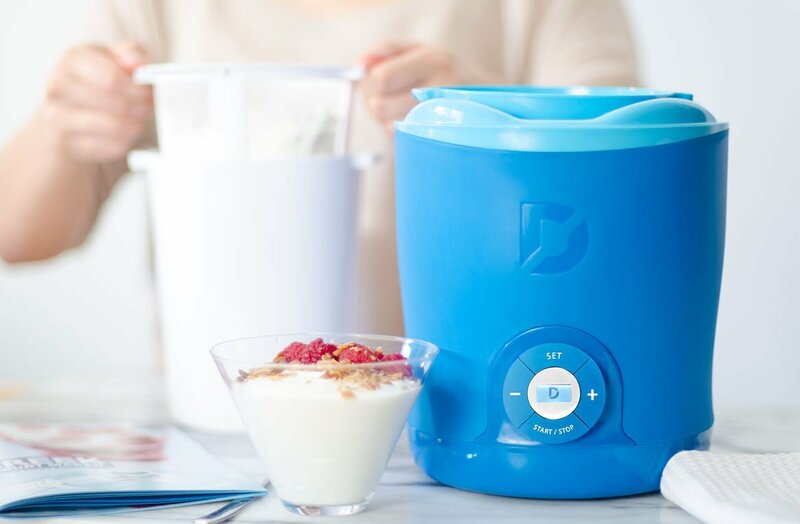 Not only does the Dash Greek Yogurt Maker sport an elegant look that will work in most kitchens, but it also makes the best Greek yogurt on the market. Available in blue, white and a more flamboyant pink, you can even choose a color to match your design. The one thing I love about this Greek yogurt maker is how simple it is in appearance, but that does not translate to how it operates. It is actually a workhorse. Using it is easy and since it comes with a user manual, you will not have a hard time figuring out how to make Greek yogurt. Included is a strainer that you can use in removing whey to have Greek yogurt. In addition to this, there is a timer that will alert you when cooking is finished. Another plus is how the containers stack up together to be stored in the maker, making it quick and easy to put away. The recipe book, like that in most yogurt makers, is not something to write home about but you will definitely thank them for including it if this is your first time making yogurt, as it will help you pick up the basics of the process. 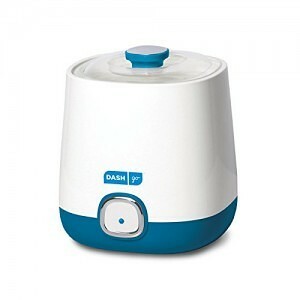 Cleaning, storage and use are all made easy with the Dash. Highly recommended. 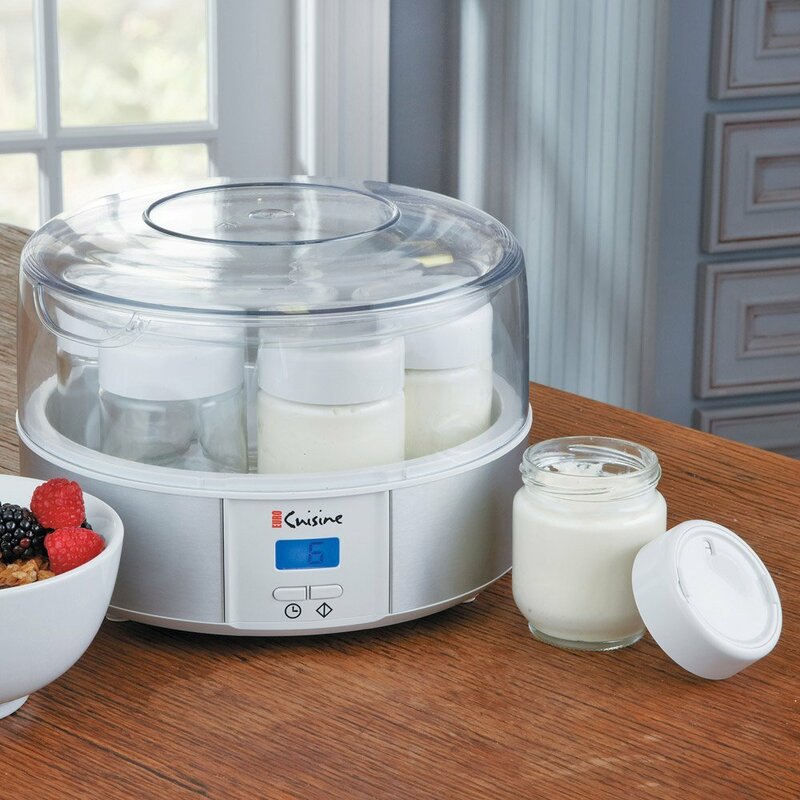 Another option for you now, the Oster CKSTYM1012 delivers great yogurt. It makes the process of making Greek yogurt so easy and you will love the result. The Oster CKSTYM1012 is made from plastic, but it does not look or feel cheap. The manufacturer has opted for glass jars which are another plus. 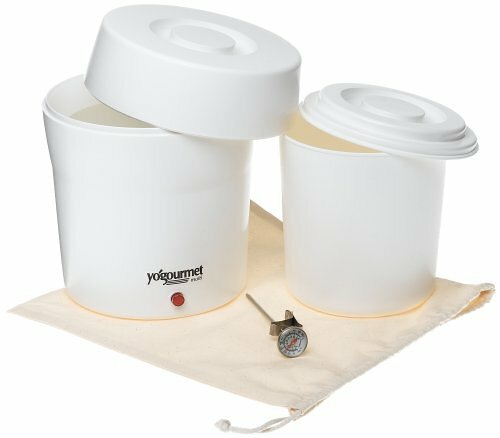 There is also a large plastic container that you can use for making large quantities of the same flavor of Greek yogurt. You might also use it if you do not want to waste time washing the individual jars, though they’re great for experimenting with flavors and preferences. A Greek strainer is already included meaning there is no need to purchase one. And getting to the Greek yogurt this makes, there is nothing you really can complain about because the yogurt is great. 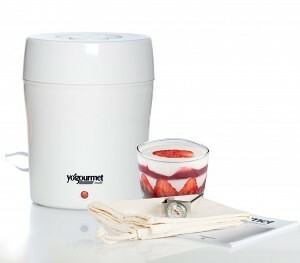 The Oster CKSTYM1012 is a great yogurt maker. Many who bought it are very happy with it and have given it a good rating, as a quick look on online retailers will show you. The two options above provide you with different options at different price points, and both stand head and shoulders above other yogurt makers when it comes to making the Greek version of yogurt. They’re both simple to use and very effective, don’t look unpleasant in your kitchen and won’t leave you disappointed when it comes to the taste test. This entry was posted in Oster.